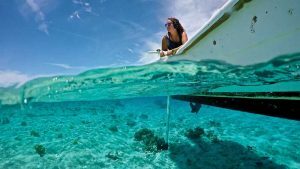 Shark research in the Turks & Caicos Islands. Caribbean reef sharks are an important part of the marine food chain. The public perception of sharks has shifted dramatically over the last couple of decades. Whereas they were once portrayed as bloodthirsty monsters, spawning the adage, “The only good shark is a dead shark,” most people now realise that sharks are an extremely important component of the ecosystems in which we find them. As apex predators, sharks have a strong controlling influence on the organisms that they feed upon, and any reduction in shark numbers is counterbalanced by an increase in their prey populations. While this might sound like a good thing, particularly to seafood lovers, the problem is that these increased populations deplete their own food sources much faster than under normal conditions, and so the knock-on effect ripples down through the food chain. The end result of this “trophic cascade” might be a radically altered ecosystem—dead coral skeletons overgrown by algae where once there were healthy coral reefs, for example. Shark populations have already experienced massive declines on a global scale, due mainly to a combination of commercial fishing pressure and habitat loss. So it is extremely important that further serious declines are prevented, not just for the sake of the sharks, but also for the populations of other species that they are connected to, both directly and indirectly. 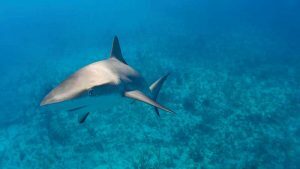 The School for Field Studies Center for Marine Resource Studies on South Caicos has been studying the ecology of local shark populations since 2005, with a view to determining their status and conservation needs. The longest running of these studies has been an investigation into habitat use by juvenile lemon sharks, a species that is classified as “Near Threatened” by the International Union for the Conservation of Nature (IUCN). Its distribution ranges from New Jersey to Brazil, and throughout this range it has experienced heavy fishing pressure, causing a considerable reduction in population size. However, the biggest threat that this species currently faces is habitat loss, as lemon sharks are reliant on shallow inshore waters during the early stages of life. In late spring and early summer, pregnant females move into extremely shallow waters close to mangroves, where they give birth to between 4 and 17 pups, each measuring around 60 cm in length. Having given birth, the females then move straight back out into deeper waters, but the newborn shark pups remain in these shallow areas for the first few years of life. As mangroves support large populations of fish and invertebrates, the shark pups have access to plenty of food as well as being protected from larger predators. Our research on this species has been mainly concerned with identifying areas of particular importance for the shark pups. What we have found is that almost everywhere that you find mangroves, you will find lemon shark pups. But, some areas do seem to be more important than others. As we have recently reported in an article for the scientific journal Aquatic Conservation, the most important area for these pups around South Caicos is the Bell Sound Nature Reserve. Not only is there a greater concentration of the sharks within Bell Sound, relative to other areas around South Caicos, but Bell Sound is also home to the smallest pups. In other words, Bell Sound appears to be an important birthing ground for the pregnant sharks, and the young sharks prefer the sheltered, shallow waters that Bell Sound provides. While our research is ongoing, it seems highly likely that the shark’s main food source is the fish that live around the mangroves in the northeastern corner of the reserve around Iguana Cay, as well as in the western part of the reserve around Man-O-War Bush. Unfortunately, Bell Sound faces an uncertain future, as there have been calls to redraw the boundary of the Nature Reserve and to downgrade it to a National Park. While these proposals would facilitate greater water-based recreational use of Bell Sound for South Caicos’ growing tourism industry, there can be no denying that any such change will negatively impact the resident lemon shark pups—particularly as there are also plans to remove some of the mangroves from around Iguana Cay. And it’s not just the lemon sharks that rely on these mangroves; most of the fish that live among the mangrove roots are juveniles of species that live out on the reef as adults. The mangroves are an essential nursery habitat for these species, without which populations of reef fish are also likely to decline. More recently, we have started to investigate the ecology of other shark species that live out on the reef and in the deeper sand flats of the Caicos Bank. Our first goal was to determine which species occur locally, in addition to the lemon sharks, and then to assess their movement patterns and habitat preferences. The main techniques that we use for this research are tag and release, and baited remote underwater video stations (BRUVS). A SFS intern listens for an acoustic tag. Tag and release, as the name suggests, involves capturing, tagging, and releasing the sharks. Captured sharks are identified to species, measured, and tagged with two types of tag. The first is an external tag called a rototag, which is placed on the first dorsal fin, and which bears a unique number. These tags are large enough to be seen by divers—if you happen to spot one of our tagged sharks, regardless of whether the number on the tag is visible, please let us know! The second tag is a small microchip that is placed under the skin, just below the dorsal fin—the exact same type of tag that veterinarians use to “chip” cats and dogs. Every time we recapture one of our tagged sharks, it provides us with information on its movement patterns and growth rate. The BRUVS are metal frames on which a camera is mounted, facing an attached bait box. We deploy these throughout the study area and then review the camera footage afterwards. This approach also allows us to determine which shark species are inhabiting different areas, and it provides information on their relative abundance. Our work in this regard is part of a larger international collaborative study known as Global FinPrint (www.globalfinprint.org), which is using footage from BRUVS deployed all over the world to assess shark populations on a global scale. So far, the species that we have most commonly encountered are Caribbean reef sharks and nurse sharks, but we also regularly encounter blacknose sharks, tiger sharks, and less commonly, great hammerhead and bonnethead sharks. We have heard reports of mako sharks and bull sharks from both fishermen and divers, but unfortunately, we have not found any evidence of either species—at least on the eastern side of the Caicos Bank. Should any of you have photographic evidence of these species or, indeed, any other shark species occurring in the Turks & Caicos, please let us know! An exciting development in our activities recently came courtesy of research funding donated by the Curtis and Edith Munsen Foundation; namely the acquisition of an acoustic receiver that allows us to actively track sharks as they move about. While this aspect of our research is still in its infancy, the results so far have been quite interesting. Some sharks seem to confine their activities to very small areas, while others like to undertake more expansive movements. As this work continues, we hope to determine if the sharks display any defined day/night or seasonal migrations. And so, our understanding of shark ecology in the waters around the Turks & Caicos Islands continues to develop, but as with most scientific research, as one question gets answered, ten more questions present themselves. It might be a never-ending quest, but studying sharks and getting to see these magnificent animals on a daily basis is a huge privilege, particularly in these beautiful surroundings. The Turks & Caicos are home to what appear to be healthy shark populations at present, and play an extremely important role in the amazing underwater ecosystems of these Islands. Let’s hope this never changes! The School for Field Studies is a US-based academic institution that provides multidisciplinary, field-based environmental study abroad opportunities to undergraduate university students. Each SFS program (9 in total) highlights a different region of the world, with its own distinct cultural and ecological characteristics and unique environmental challenges. For more information on shark research in the TCI, email ahenderson@fieldstudies.org.